The Cumberland Community Mediation Center (CCMC) recently received a $14,000 grant from the Alabama Cooperative Extension System - Urban Affairs and New Nontraditional Programs Unit (ACES-UANNP). Kevin H. Crenshaw '98, Legal Consultant for the ACES-UANNP, and Cassandra Adams, Director of the CCMC and Public Interest Program, spearheaded the collaboration. The grant will be allocated over a two-year period, during which Adams will help to bring alternative dispute resolution to Alabama's aging community. The mission of the ACES-UANNP is to “provide learning opportunities to meet the needs of all urban and nontraditional audiences with a specific focus on limited resource families, underserved audiences, individuals and small enterprises.” The grant awarded to the CCMC is allocated from an Alabama A&M capacity-building grant entitled “Successful Aging Initiative: Community-Based Education to Promote Health and Asset Management for Alabama’s Older Adults.” Among other project goals, Adams will be responsible for helping to develop and implement a community mediation program with an emphasis on senior mediation, providing mediation training to ACES-UANNP representatives, and developing a community pipeline to announce the availability of community mediation services through local senior centers, community resources, and academic and legal outlets. 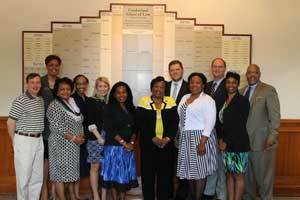 A lunch meeting regarding the collaboration between the ACES-UANNP and the CCMC was held at Cumberland School of Law on May 20. Representatives from ACES-UANNP were present, as well representatives from Cumberland School of Law and the greater Samford University community. The group brainstormed ideas, pooled resources and shared contact information in hopes of accomplishing much together over the next two years and beyond. “I am thrilled about this collaboration and I believe we are well on our way to developing and implementing a program that fully addresses the legal, financial, and health-related needs of some of Alabama’s most vulnerable individuals and families,” said Kevin Crenshaw ’98, Legal Consultant for the ACES-UANNP. Pictured in photo from left to right: Tim Wolfe, Cassandra Adams, Constance Wilson, Nikkya Moore-Coleman, Polly Manuel, Maisha Freeman, Celvia Stovall, Ken England, Chanda Crutcher, David Hutchens, Denise Gregory, Kevin Crenshaw.